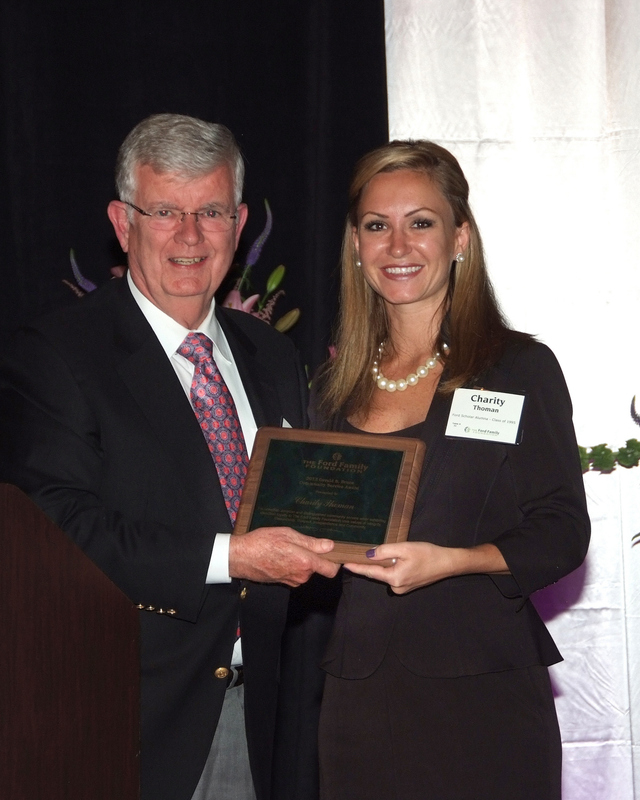 Ford Family Foundation Board Member Joseph Kearns presented Ford Scholar Alumna Charity Thoman with the Gerald E. Bruce Community Service Award during the Ford Scholars Recognition Conference in Eugene on July 13, 2013. The Class of 1995 Ford Scholar received graduate funding from the Foundation to attend Tulane University School of Medicine, where she received a master’s degree in public health and tropical medicine and became a doctor of medicine. She works as the deputy health director for the Santa Barbara County Public Health Department in California. “I was a poor kid from a poor town,” Thoman said during her acceptance speech, adding that the Foundation changed her life. This award is accompanied by a donation of $5,000 from the Foundation to a non-profit of the recipient’s choice. Thoman chose the Pacific Pride Foundation, an organization that provides medical care and services to HIV/AIDS patients. Thoman volunteers for this organization and was recently elected to its board of directors.